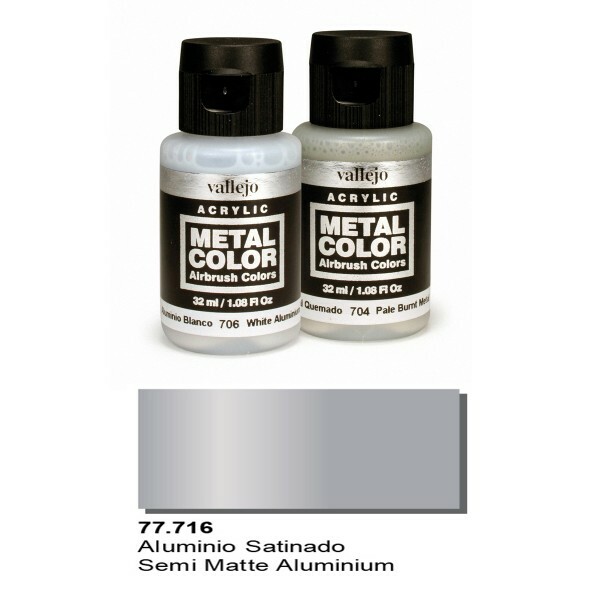 Vallejo Metal color: "Semi matte Aluminium"
This product was added to our database on Thursday 3 September 2015. Vallejo Metal Colour is a range of 18 water-based metallic colours, especially designed for airbrushing. In the development of this new and innovative range, the latest generation of aluminium pigments has been used in a specifically designed formula to produce colours of exceptional resistance and adherence to plastics and metal. Can be applied directly on models without the need for the use of a primer, although in the case of fuselages and components for airplane models it is recommended to first apply a glossy Black Primer to bring forth the unique and special quality of the aluminium finish. Supplied in 32ml Bottles with a flip-top/dropper closure.